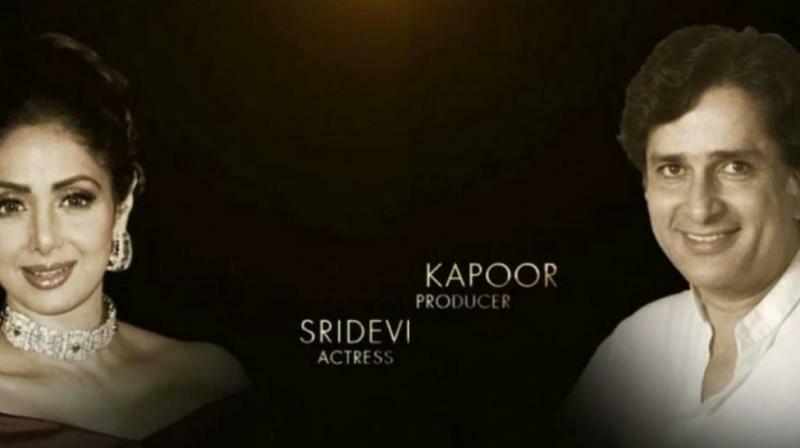 Los Angeles, March 5 (IANS) Indian cinema icon Shashi Kapoor and India’s first female superstar Sridevi were honoured at the 90th Academy Awards ceremony here during the “In Memoriam” montage. The Indian stars got a musical tribute by Eddie Vedder who took the stage to sing Tom Petty’s “Room at the top”. Actress Jennifer Garner introduced the segment by paying tribute to late star Audrey Hepburn. “There is no joy without sorrow,” Garner said, and then acknowledged the loss of film world with the departed souls. Son of Prithviraj Kapoor and younger brother of Raj Kapoor and Shammi Kapoor, Shashi Kapoor made his debut in Bollywood with the 1961 film “Dharmputra” after working as a child artist. He passed away in December 2017. Bollywood’s ultimate “charm house” Shashi Kapoor then went on to make a name for himself globally by associating with international cinema. He was honoured with the Padma Bhushan — the third highest civilian honour — by the Indian government in 2011. In 2015, he was bestowed with the Dadasaheb Phalke Award. Sridevi, known for her ability to slip into myriad roles, expressive eyes, sheer comic timing and her fluid dancing skills, died on February 24. Her death left everyone shocked, and saddened. They were included in the annual montage along with stars such as John Heard, Tony Anne Walker, Jane Foray, Robert Osborne, Martin Landau, Glenne Headly, Roger Moore, George A. Romero and Jerry Lewis. With Jimmy Kimmel as a host, the ceremony was held at the Dolby Theatre here on Sunday night. Ambani scion Akash to be betrothed to diamantaire's daughter Shloka?